The popular movie “Finding Nemo” might have been on the big screen several years ago, but recently the film’s main character appeared on a much smaller stage — under an electron microscope at Auburn University. While researching methods that might one day lead to a successful charge of your cell phone in two seconds, Armin VahidMohammadi, a 30-year-old doctoral student in Auburn’s Samuel Ginn College of Engineering, found a likeness to the animated clownfish. The image was at a size 10 times smaller than the width of a human hair, swimming through shadowy layers of two-dimensional conductive nanomaterials called Mxene. For VahidMohammadi, it was just another day at the office. “I’m doing my research, and they’ll just pop up and randomly start to look like something,” he said of the likenesses to pop culture characters he regularly spies in nanomaterials with the assistance of a $500,000 JSM-7000F scanning electron microscope, or SEM. 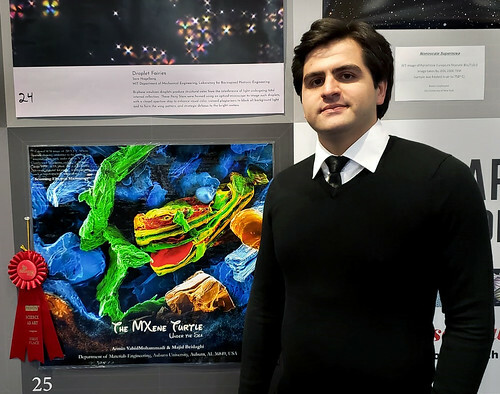 VahidMohammadi’s discoveries are well known on a growing competition circuit cultivated by aesthetically minded materials engineers who regularly interpret aspects of their research as works of art. 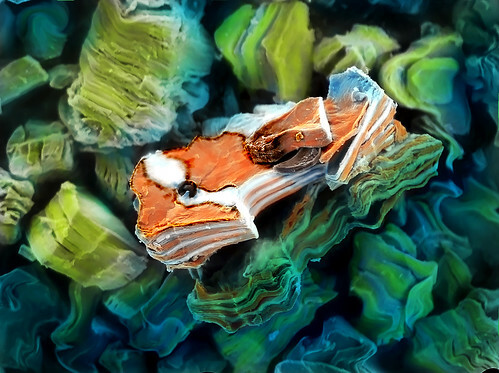 His find of “Nemo” — named “Nano Nemo on the Water” — earned him a grand prize in an annual Scanning Electron Microscope image contest by the Japanese company JEOL, a global supplier of electron microscopes. The microscopic images are black and white so once VahidMohammadi spots a familiar face, he brings it to life in Photoshop. He then submits the colorized version to the JEOL contest. 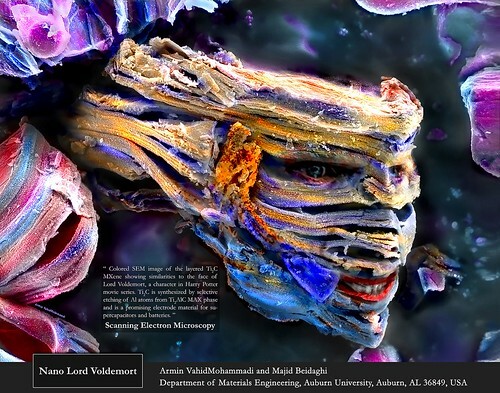 In 2016, VahidMohammadi’s find of the incredible “Nano Lord Voldemort” of Harry Potter fame, conjured from MXene particles, placed first out of nearly 200 submissions in the Materials Research Society’s semi-annual Science as Art competition. Two years later, he won first again with a turtle he spotted in clouds of vanadium carbide, which wowed attendees at the 2018 Fall MRS Meeting and Exhibit in Boston. The Science as Art competition, which began in 2005, is open to the nearly 15,000 society members across the globe. Only two have won first place more than once. The only student? Auburn’s VahidMohammadi. “I don’t think most people realize it, but those awards are very competitive,” said Majid Beidaghi, an assistant professor in mechanical engineering and VahidMohammadi’s faculty advisor. Beidaghi is the ideal faculty advisor for VahidMohammadi. Before coming to Auburn, Beidaghi was on the Drexel University research team that discovered MXenes in 2011. “When I was doing my postdoctoral work at Drexel, I used to work with students [on their entries] and it was very challenging. We maybe had one student win an award. Most just submitted things without really getting a good result. And he doesn’t just mean in the lab. The final project he put his name on before coming to the United States in 2013 involved rendering computer-generated imagery of Old Tehran for a made-for-television murder mystery. “I was doing my studies and then working on those things,” VahidMohammadi said. “That was my outside work. And it’s a match made in publicity heaven. The latest issue of Advanced Materials features VahidMohammadi’s research on assembling 2-D MXenes into highly stable pseudocapacitive electrodes that could charge almost instantly and provide power to supercapacitors for millions of charging cycles. An Auburn doctoral student uses his passion for art and science to dominate national image competitions. The nanomaterials — 10 times smaller than the width of a human hair — he finds with a scanning electron microscope have resembled Harry Potter’s nemesis Lord Voldemort and a Disney/Pixar clown fish named Nemo. Armin VahidMohammadi, a 30-year-old doctoral student in Auburn’s Samuel Ginn College of Engineering, won first place with a turtle he spotted in clouds of vanadium carbide, which wowed attendees at the 2018 Fall MRS Meeting and Exhibit in Boston. 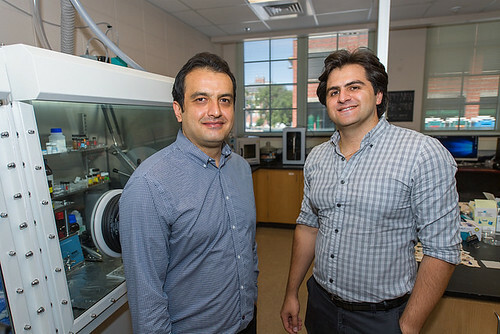 Majid Beidaghi, an assistant professor in mechanical engineering in Auburn’s Samuel Ginn College of Engineering, is the faculty advisor for doctoral student Armin VahidMohammadi.